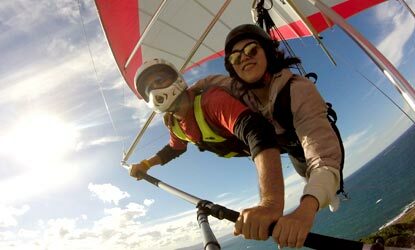 Why not consider a tandem hang gliding gift voucher for that special someone. Our hang gliding gift vouchers can be used for any special occasion, a thank you, an anniversary, a Christmas gift voucher or when you just don't know what to buy for the person who has everything. 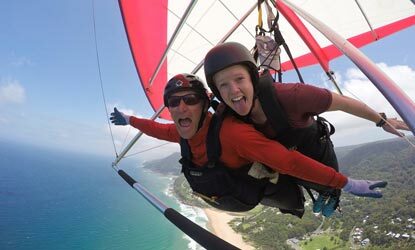 The gift voucher is redeemable for a 30 minute tandem hang glide (trial introductory flight) from Stanwell Park, one of the premier coastal flying sites in the world. 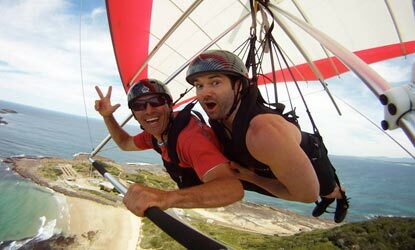 We also fly from Hill 60 in Wollongong. 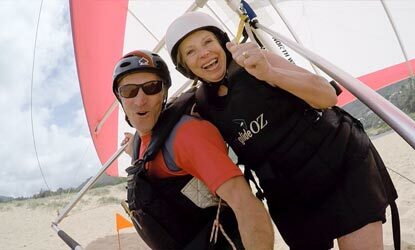 Our mission is to provide our customers with a fun and memorable introduction to hang gliding. Our professionally designed gift vouchers will make a memorable gift. All our gift vouchers include inflight photos of the flight, free of charge (RRP $45). To purchase a voucher please fill out the following form. Once you have entered all the required fields please select the payment option. Include inflight photos free of charge (normally $45) & sent via email. Redeemable any day of the week. Including inflight photos free of charge (normally $45) & sent via email. Redeemable Monday through to Friday. Your voucher will be professionally printed and packaged. Includes inflight photos free of charge (normally $45) and sent via express post. Vouchers are valid for 12 months after issue. Vouchers are non-redeemable for cash and non-refundable. However they are transferable, upon written request. As we are working with the weather, HangglideOz reserves the right to reschedule without penalty. A weight limit of 95kg (Stanwell Park) and 85kg (Hill 60) apply. Passengers must be over 14 years of age.